"An oil-free, anti-aging water cream that releases a burst of skin-improving Japanese nutrients, powerful botanicals, and optimal hydration for poreless-looking skin. The Water Cream provides nutrient-rich, balanced hydration with the unique water-burst that breaks upon application to deliver nourishment without leaving skin sticky or greasy. It clarifies and refines skin with pure, powerful Japanese botanicals: Japanese wild rose visibly tightens pores and smooths skin texture; Japanese leopard lily helps control excess oil and purify skin by supporting natural skin turnover; and hadasei-3—an anti-aging trinity of green tea, rice, and algae—restores healthy-looking radiance. Beauty icons for over 300 years, geisha adopted Japanese wild rose to create a refined, poreless-looking canvas underneath their makeup. The Water Cream has harnessed this potent botanical to honor the original makeup lover." I was the lookout for a new moisturizer since my beloved AmorePacific moisture bound refreshing Hydra-Gel was running out and VIB sale was just around the corner (yay for good timing!). I initially wanted to repurchase the latter, but suspected that it might a tad bit heavy for summer, even if it's a cream/gel. 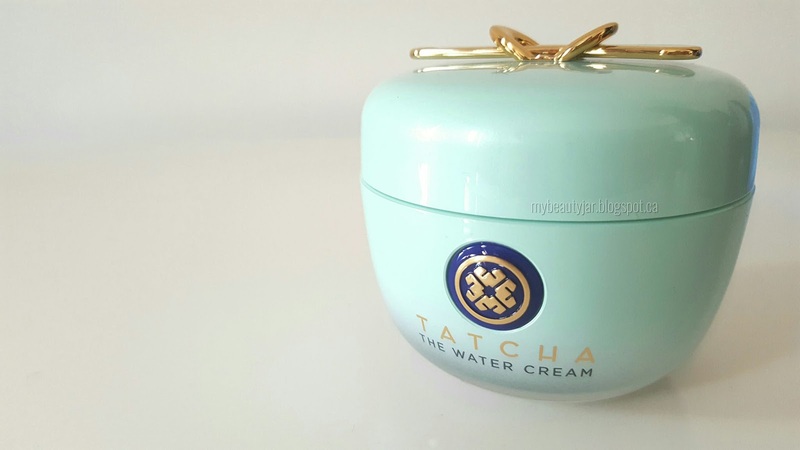 I was browsing on Sephora website to see if there was something more suitable for the warmer weather and Tatcha's new moisturizer, the water cream, caught my attention because of its beautiful packaging. However, VIB sale was only a few days away so I decided to wait. When the sale came, I decided to go into my local Sephora store because I wanted to test out the texture of some moisturizer I know they have in store. To my surprise, Tatcha is now available in Montreal and the water cream was on top the display screaming "PLEASE TRY ME!". I tested the product on the back of my hand and it was love at first touch. I was sold and wanted to throw one into my basket but they were sold out. Crap. I went home home with a sample of it instead to test it out and perhaps buy it online before the sale ends. *Piece of information that might be useful to know: I have normal to combo skin, forehead very prone to milia and dehydrated cheeks during the winter. The product itself has the consistency of a cream-gel that blends very well and doesn't leave any greasy or tacky residue. As you blend the product into your skin, it feels like it dissolves into water and it's very refreshing. My skin absorbs it within minute and appears more radiant and dewy. I had a eczema patch starting on my chin, due to stress and a reaction of a new skincare product that it didn't liked, but the Tatcha water cream didn't irritate that zone at all. My skin felt more soothed and the eczema patch was gone the following day. I never had that happened. Ever. Even with skincare targeted toward very sensitive skin. 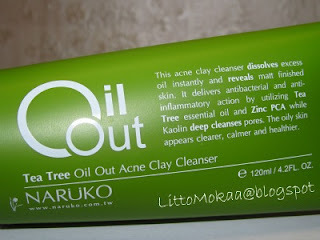 Also, it didn't blocked my pores, as my forehead is prone to milia and zits here and there. However, I did notice that throughout the day, my T-zone got tad bit shiny, but not to the point it bothered me. Scent wise, it smell like roses, but it's very faint. I really appreciated the fact that it's not overly perfumed as most of the moisturizer on the market. 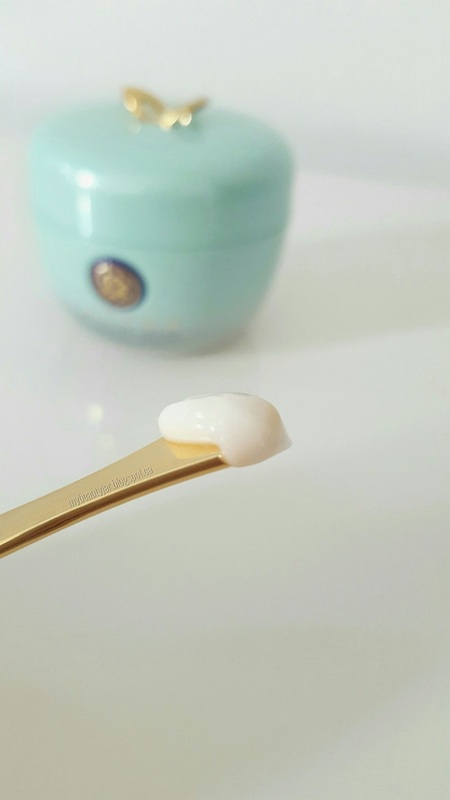 I have a strong feeling that this cream will be my HG this summer, however I don't think it will make the cut for rough Canadian winters, unless you have very oily skin. Have you tried Tatcha the water cream? What is your favorite moisturizer?